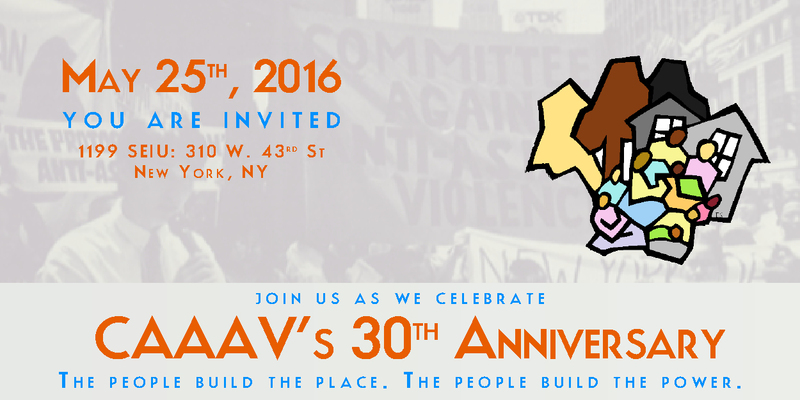 TICKETS CLOSED for CAAAV's 30th Anniversary Gala! CAAAV Organizing Asian Communities is excited to celebrate our 30th anniversary The People Build the Place, The People Build the Power- a festive night of awards, food, performances, and community. Thanks to so many generous community members purchasing their tickets already, we have reached capacity and closed ticket sales. If you want to still make a donation, you can do so on the form below. If you have questions about the event or would like to be updated on whether seats become available before the gala, you can contact Ruben at ran@caaav.org.